Starting after the 2010 election, legislators in nearly half the states passed a wave of laws making it harder to vote. This resource includes a series of maps to help visualize the impact of these restrictions. Starting after the 2010 election, legislators in nearly half the states passed a wave of laws making it harder to vote. These new restrictions ranged from cuts to early voting to burdens on voter registration to strict voter ID requirements. 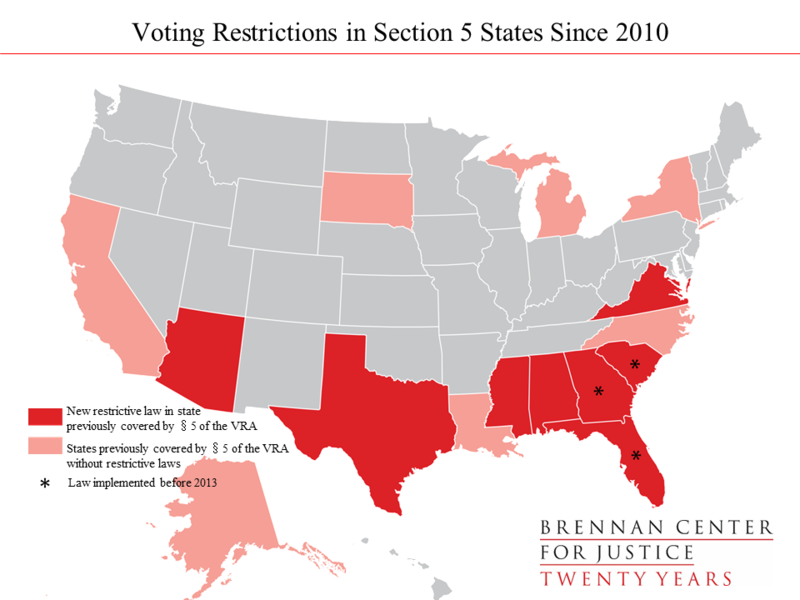 While courts stepped in before the 2012 election to block many of these laws, the Supreme Court’s 2013 decision in Shelby County gutting the most powerful protections of the Voting Rights Act made it even easier for states to put in place restrictive voting laws. In the run-up to the 2016 presidential election, the surge in attempts to make it harder to vote has been met by a pushback by courts, as many challengers fighting against these laws have secured victories softening or eliminating the restrictions. Click here to see the 14 states with new restrictive voting laws in effect for the first time in 2016. For a look at all 20 states with new restrictive voting laws in effect since 2010, click here. To see which of the 14 states with new laws in 2016 were previously covered by Section 5 of the Voting Rights Act, click here. Race played a factor in which states passed new voting restrictions. In response to demographic shifts, including recent growth in population or voter turnout among ethnic or racial minorities, many states passed new restrictive laws. Click here for more. Among the types of restrictive laws passed, strict photo ID laws are particularly on the rise. To see the dramatic change in the landscape of strict photo ID laws since 2004 — most notably, the explosion of strict photo ID laws between 2010 and 2016 — click here. A lot of courts have found that these new restrictions violate the Constitution or the Voting Rights Act. Click here to see maps of these victories and other ongoing voter litigation. For a look at legal challenges to restrictive photo ID laws since 2010, click here. For a look at the strict photo ID laws in effect in 2016 or recently blocked, click here. Over 100 million Americans will cast a ballot this November, after the biggest rollback to voting rights since the Jim Crow era. But progress is possible: Before the summer recess, congressional Democrats introduced  a transformative bill that could automatically register up to 50 million new citizens to vote. Recent litigation victories in Alabama, Georgia, Kansas, North Carolina, North Dakota, Texas, and Wisconsin also signal hope that rollbacks to voting rights can be stopped. Between now and November, watch the courts for the latest developments on what voters will encounter at the ballot box this year. This document illustrates the current voting landscape and uses maps to analyze how we got to this point. Voters in 14 states will face new voting restrictions for the first time during a presidential election this year. Those 14 states are: Alabama, Arizona, Indiana, Kansas, Mississippi, Nebraska, New Hampshire, Ohio, Rhode Island, South Carolina, Tennessee, Texas , Virginia, and Wisconsin . The number was 17 as recently as July, but recent court rulings blocked restrictive measures in Georgia, North Carolina, and North Dakota. Despite a recent court victory mitigating the impact of Texas’s photo ID law, it is still counted because the measure is more restrictive than the previous requirement. You can read about each state’s new restrictions on our interactive map . A PDF version is available here . After the 2010 election, state lawmakers nationwide started introducing hundreds of harsh measures to make it harder to vote. 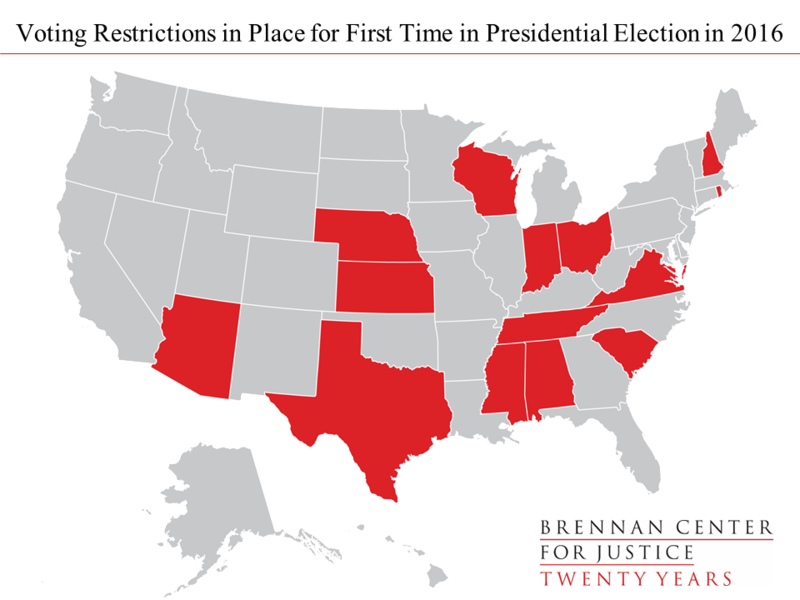 Overall, 20 states have new restrictions in effect since the 2010 midterm election that restrict access to registration and voting. For details on each state’s new restrictions, check out our interactive map . A PDF version is available here . More information on the bills across the country can be found here , here , here , here  and here . Many new restrictive voting laws went into effect after the Supreme Court gutted Section 5 of the Voting Rights Act in Shelby County v. Holder in 2013. Under Section 5, states and localities with a history of racial discrimination in voting had to seek federal “preclearance,” or approval, from either the Department of Justice or a federal court before implementing any changes to their voting laws and procedures. In the Shelby County decision, the Supreme Court eviscerated that portion of the law, giving states with a history of discrimination free rein to change their voting laws without prior approval. Of the 14 states with new restrictive voting laws in effect for the first time in a presidential election this year, six were previously covered by Section 5 of the Voting Rights Act. Five of these states — Alabama, Mississippi, South Carolina*, Texas†, and Virginia — have new voter ID laws in place. * Prior to the Shelby County decision, South Carolina’s law was approved by a federal court under Section 5 of the Voting Rights Act. The court read the law to include a reasonable impediment exception to the photo ID requirement and delayed implementation of the law until after the 2012 election. † As of August 2016, in compliance with a decision from the full Fifth Circuit Court of Appeals, Texas has agreed to allow voters without one of the limited forms of photo ID to claim a reasonable impediment to obtaining ID; show an alternative form of identification from a long list that includes paychecks, utility bills, and government documents; and vote a regular ballot. Of the 15 states previously covered by Section 5, nine have new restrictions in place since 2010. The loss of the full protections of the Voting Rights Act enabled states to put laws into place that had already been or that would have been blocked by Section 5. In Texas, for example, the state put a strict photo ID law into place immediately after Section 5 was gutted that had already been blocked as racially discriminatory under Section 5. And, in South Carolina, a strict photo ID law was weakened in 2012 because the state was at the time under Section 5’s preclearance regime, and a Section 5 court read the law to allow for an affidavit alternative for voters with a reasonable impediment to getting ID. In a broad wave of voting restrictions passed since 2010, 20 states have cut back on voting access, with two more states passing laws that were recently blocked by courts. Still others, like Arkansas and Pennsylvania, passed restrictions that were quickly and permanently blocked by courts. The key factors that account for these new laws are partisanship and race. As this map makes clear, the states most likely to pass new voting restrictions were those with the highest African-American turnout in 2008, those with the highest Hispanic population growth between 2000 and 2010, and/or those formerly covered under Section 5 of the Voting Rights Act. Of the 11 states with the highest African-American turnout in 2008, 6 have new restrictions in place. North Carolina also fits this category, but its law is currently blocked for the 2016 election. Of the 12 states with the largest Hispanic population growth between 2000 and 2010, 7 passed laws making it harder to vote (again, North Carolina’s law is currently blocked). 9 out of the 15 jurisdictions previously covered in whole or in part by Section 5 of the Voting Rights Act have new restrictions in place. North Carolina also fits this category, but its law is currently blocked for the 2016 election. 4 states put restrictions in place directly after the Shelby County decision: Alabama, Mississippi, North Carolina, and Texas. Among the many restrictive voting laws passed since 2010 , the most burdensome are strict photo ID requirements, which permit voters to show only a small number of government-issued photo IDs in order to cast a ballot. Approximately 600,000 registered voters in Texas did not have acceptable IDs required under the original strict law, which has since been softened. Nationwide, approximately 11 percent of Americans lack government-issued photo ID, including a disproportionate number of people of color, seniors, and young people, according to one analysis. If voters in one of these strict photo ID states do not have a required form of ID on Election Day, they may vote a provisional ballot. But to have that vote counted, they will have to return to the polls within a few days to prove their identity. When Georgia and Indiana passed their strict photo ID laws in 2005, they were outliers. But the number of strict photo ID laws has exploded since 2012. Although states continue to pass new laws, courts have already blocked or mitigated some of the worst measures before the 2016 election. This November, voters in 8 states will face strict photo ID laws at the polls. This sequence of maps traces the history of strict photo ID laws in the U.S., showing how many states had strict photo ID laws in effect in recent presidential elections and how many are expected to have them this fall. Many of the restrictive voting laws passed since 2010 are being challenged in court — and many of those lawsuits have succeeded in blocking or mitigating the challenged laws. Ten states currently have major ongoing litigation  that will impact voter access, and seven have succeeded, at least partially: Alabama, Georgia, Kansas, North Carolina, North Dakota, Texas, and Wisconsin. See our interactive map tracking this litigation here , or view a PDF version here . Photo ID laws have been especially contentious in the courts in recent years. Six states have ongoing lawsuits over photo ID laws. Litigation wins in the summer of 2016 in three of these states — North Carolina, North Dakota, and Texas — show renewed progress in the courts. Even before 2016, in Arkansas and Pennsylvania, courts intervened to block strict photo ID laws that would otherwise have been in effect for the first time in a presidential election this year. In Wisconsin and Virginia, courts upheld restrictive photo ID laws that are in effect for the first time in a presidential election this year. Before 2010, courts blocked photo ID laws in Missouri, and upheld them in Georgia and Indiana. Strict photo ID laws have cropped up across the country since 2005. A vast majority of the eight laws currently in effect passed in the last five years. Beyond that, half of these states — Alabama, Mississippi, Virginia, and Wisconsin — have never tested their laws in any presidential election. Tennessee’s ID law was in place in 2012, but was made more restrictive since then. But change is still possible. North Dakota’s photo ID law was blocked by a federal court in summer 2016. North Carolina’s was softened by the legislature, and then struck down by a court. And Texas’s law was re-fashioned to create exceptions for voters without ID.